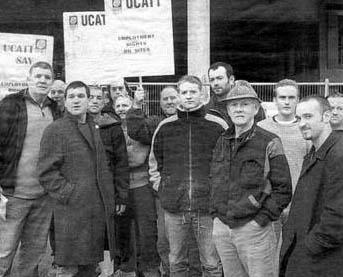 Brian Higgins, a militant in the building industry, first in UCATT and later in UNITE, has been taken into hospital. Brian has been the most blacklisted worker in the UK. For many years before he would have retired, he was unable to get work. This put immense pressure both on Brian and his family, particularly his ever-supportive wife, Helen. Following the public exposure of the blacklist in the building industry, Brian found strong evidence of collaboration between the employers and a UCATT official in his blacklisting. That official cited in a redacted document was Jerry Swain. Subsequently, Len McCluskey arranged for UCATT to be taken over by UNITE. In the process, Swain was appointed as a full-timer. Brian, the rank and file Building Worker Group and other union members have tried to raise this issue with McCluskey. McCluskey continually brushes the issue under the carpet. Brian thanks all those who have supported his cause, and the cause of other blacklisted workers. This support has come from many including the Building Worker Group, activists in Grassroots Unite, the Scottish Federation of Socialist Teachers and the Emancipation & Liberation blog. Until our trade unions have kicked out all those who collaborate with the employers, then our fight for justice, improved pay and conditions and safety at work will be undermined. Despite Brian’s current incapacitation the struggle goes on, and Brian’s supporters will continue to raise these issues. Well done Brian. Best of luck, but don’t have any high expectations from Tame Union bureaucrats.